I’ve been writing resumes professionally for over 10 years now and in that time I’ve seen expectations change a great deal. I am continually changing the style and structure of my resumes to appeal to today’s hiring managers and recruiters and, now that we’re into the new year, it seems like a good time to share the ideal 2018 resume format with you. One page resumes are best if you have less than 5 years of experience, otherwise you will likely need two pages – but NO MORE! Attention spans continue to shrink and recruiters simply won’t pay attention to long or overly wordy resumes. It’s important to discipline yourself. Keep sentences short. Make sure there is lots of white space on each page to make the resume easy to read, and use formatting to draw attention to key points. It’s tempting to want to stand out by creating a unique resume structure or format but in most cases, this is a mistake. Recruiters want to skim your resume quickly and se the salient information – they can’t do this if they are trying to figure out where the key points are. For this reason, please avoid writing a functional resume. Employers don’t want to read a lot of fluffy stuff about how great you are with people and what a good communicator you are – they will decide that for themselves when they meet you! At this stage, they just want to know whether you have done a good job for other employers – the best way to show them this is to write action-packed accomplishment bulet points (see more about this here). At the very least, you should have a fully completed LinkedIn profile and the link to this should be prominently featured on your resume. If your resume is missing this, recruiters will assume you are behind the times and this will hurt your chances of an interview. If you have a professional presence on Twitter, Instagram or any other social media site, include those too – and if you are in a creative professional you absolutely must have a web portfolio link prominently on your resume. (note – if you use Twitter to post political polemics, or Instagram to post photos of your dog, leave them off your resume). So what does a good resume look like in 2018? 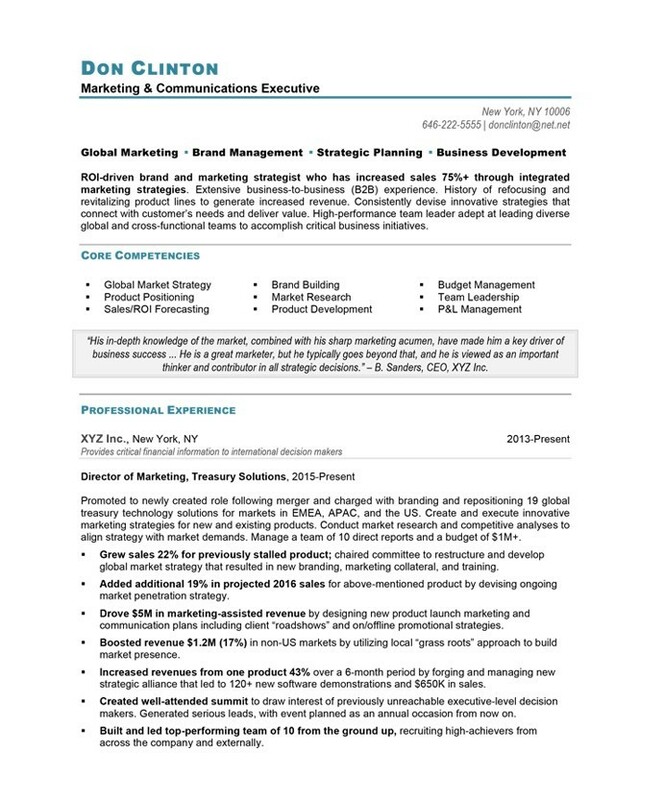 Here are 3 resumes that have ideal formats for today’s market. (Each were written for real people but have been disguised). You can see that this resume begins with the client’s name immediately followed by a description of what he does. This makes things really easy for busy recruiters. Next the introduction which leads with a result (75% growth) and also includes a quote for extra impact. Notice that, when we get to the career history, each bullet is results-focused and most of them include actual numbers. Always do this if it’s possible. Here the introduction is kept more concise and bullet points are used to make this section really easy to read. 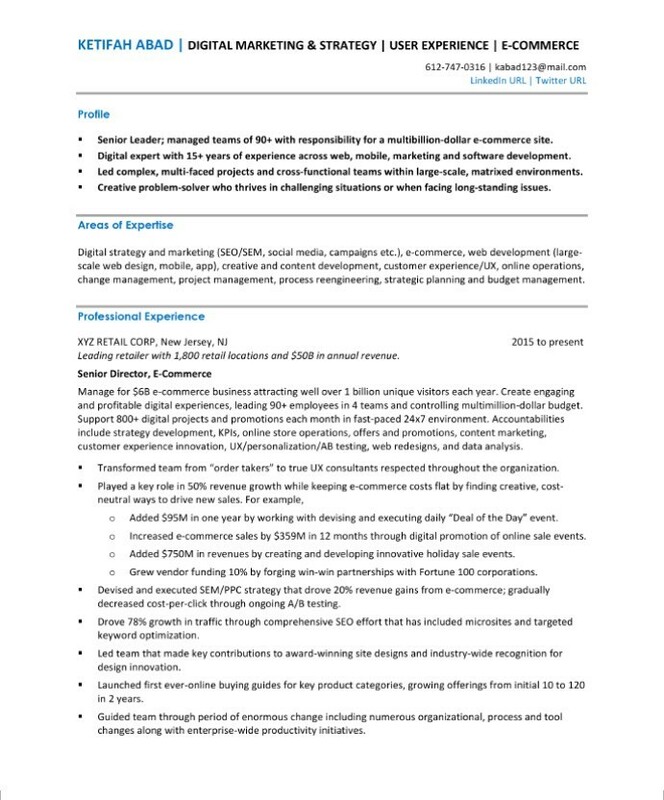 A skills listing was used to ensure that keywords were included in the resume. Again each of the accomplishments is focused on the impact my client made. Again, the introduction is bulleted. I’m increasingly favouring this approach as it means busy recruiters don’t have to scan a dense paragraph to find the key information. 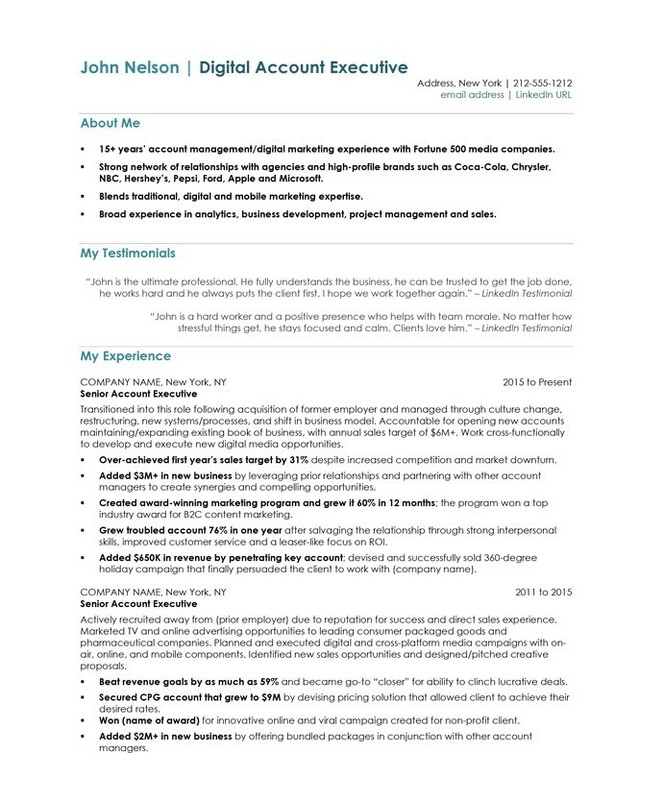 Quotes are again used and the format (right-alignment) breaks up the resume and gives some nice white space. The beginning of each accomplishment bullet point is bolded to draw attention to John’s successes in each of his prior roles. One of the nice things about my job is that I see the positive effects of my work every day. My clients get hired faster – and often into better jobs – than they expected. But it’s not because I have a magic wand. It’s simply because I follow my tried and true rules for writing an effective resume. If you follow them, you will see the results too. For more resume help, sign up for my free resume writing course or shoot me an email if you would like a free quote for me to rewrite your resume. (As a blog reader, you get 10% discount on our services – just mention the blog in your email).